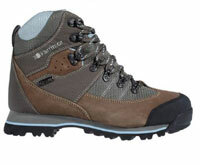 Karrimor's Blencathra is a contemporary looking, fabric walking boot with a relatively high-cut. The boots have decent 5mm lugs on a moderately stiff, Vibram sole; there's protection around the toe and heel areas but the reinforced toe 'box' is relatively short. On the interior there's a generous amount of padding around the bellowed tongue and ankle; the eVent liner is clearly visible and you can see that this finishes about 7cms from the top of the inside of boot. I've been wearing them on a couple of Staffordshire moorland walks over some quite varied terrain - mostly moorland (often muddy) but also over some stoney paths and sections of road. Overall - my feet were very comfortable all day; there's good traction over mud and wet grass; moorland stoney paths were no problem as my feet and ankles felt well protected. These were late winter walks - and my feet were comfortably warm and dry in some light, intermittent rain. I've yet to really 'challenge' the waterproofness in heavy and persistent rain so will report back on this over the next few weeks. Very comfortable and with a high cut design, Karrimor's Blencathra are a good option for boggy moorland walking or even for Wainwright bagging. Although leather uppers may be more durable in the longer term, these are a competitively priced boot for general hill walking.